AMI Consulting, Bristol, 26/02/2014 – According to a recently published study by leading industry consultants, Applied Market Information Ltd (AMI Consulting), among the factors that will significantly impact the growth of PE film usage as well as the level of global trade in finished film will be shale gas development in the U.S. This will lead to major reduction in the cost of PE resin in addition to reducing the energy cost of subsequent film production. It is highly probable that North America will have a polymer cost base on a par with that in the Middle East, leading to PE film exports from North America overtaking those of the Middle East. Looking beyond 2018, this projected cost advantage, when combined with the technological expertise of U.S. polyethylene film producers, will ensure North American PE film producers become truly global players. Other factors that will have an impact on the growth of PE film production will be the continuing investment in export-oriented regions such as the Middle East and Southeast Asia, and the growth of middle classes in less developed global regions. Within the global marketplace there will be real winners and losers. A detailed cost comparator is included in the study covering each of the ten global regions. In 2013 Northeast Asia (including China) was the highest producer region with one-third of global production of PE film, followed by NAFTA with a 17% share and Western Europe accounting for 15% of global production. By 2018 it is forecast that Northeast Asia will have increased market share of global production to over 35%, while NAFTA’s share will remain unchanged and Western Europe’s share will fall significantly, largely as a result of continuing economic difficulties in some of the member states combined with high costs of raw materials, energy, labour and freight. Western Europe will continue to grow in terms of tonnage only because it remains one of the cradles of technical development of PE films (the other being NAFTA) and continued success will depend on a shift of business towards higher added value film products. Meanwhile the Middle East will increase its market share by growing production at over 10% per annum, making it the fastest-growing global region in percentage terms. Inter-regional traded volume has grown significantly over the past few years to reach over 3 million tonnes per annum, with Northeast Asia and Southeast Asia jointly accounting for over half this traded volume. An additional half million tonnes per year is forecast to be traded by 2018, driven by increased volumes of film on the reel rather than bags and sacks, which will decline as a result of environmental initiatives in several global regions. 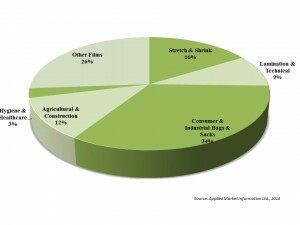 ‘Polyethylene Film Products – the Global Market’ is a detailed multi-client research study published January 2014. For further information please contact John Campin at AMI Consulting: [email protected] or +44 117 924 9442.